Beginning October 1, 2017, individuals with traffic-related fines in multiple jurisdictions in King County will have an easier and less expensive way to pay court-mandated fines through the new Unified Payment (UP) Program. This program also lifts the hold on a person’s driver’s license before the fines are paid in full. Must have two or more tickets in two or more courts in King County. Tickets must have a hold or potential hold against the individual’s drivers license. Must have an ability to pay (those without the ability to pay should contact the court in which the ticket is filed). Must take care of any outstanding warrants issued by a court in King County. Court customers with suspended licenses due to failure to respond/pay contact a court where they have fines to receive the necessary documentation needed in order to complete the online application. Using the documentation provided by the court, the customer will submit an online application. The payment agency works with individuals to determine a realistic payment plan, as low as $25.00 per month, which includes a $7.00 fee. Once the payment agency receives the first installment, participating courts will be notified and they will notify the Washington State Department of Licensing that the hold can be removed from the person’s driver’s license. Why is this program needed? Shouldn’t people just pay their fines? Court fines can be a barrier for people, particularly those with limited economic means. In 2016, 66,000 people in King County had court fines that could have led to automatic suspension of their driver’s license. Because fines are often collected through a collection agency, the baseline fines can grow exponentially due to interest and collection fees. This program allows people to pay back the fines without collection and interest fees, and lifts the hold on the license at the first payment. Through the traditional collection agency process, the hold is not lifted until all fines are recovered. If a customer defaults on the UP Program, the payment agency sends a notice to the court, which then removes the case from the program. At that point, the court may assign the case to the collection agency and notify the Washington Department of Licensing to issue a hold on the license. Linebarger Goggan Blair & Sampson (LGBS), LLP. Participating courts include King County District Court and the Municipal Courts of Algona, Auburn, Bellevue, Black Diamond, Bothell, Burien, Carnation, Clyde Hill, Des Moines, Enumclaw, Federal Way, Hunts Point, Issaquah, Kenmore, Kent, Kirkland, Lake Forest Park, Maple Valley, Medina, Mercer Island, Newcastle, Normandy Park, North Bend, Pacific, Redmond, Renton, Sammamish, SeaTac, Seattle, Shoreline, Skykomish, Tukwila, Woodinville and Yarrow Point. The $7.00 monthly fee pays for LGBS to administer the UP Program. They work directly with clients to identify a customized payment plan, and interact with the courts to make the program successful. See the examples below for a breakdown comparing the UP Program with a collection agency. 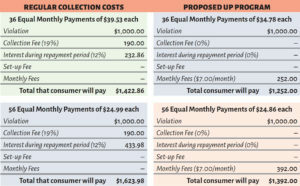 A program application can be obtained by contacting the payment agency at 1-844-544-5242, online at www.KingCountyUP.com, or by contacting any court of limited jurisdiction within King County.